A Time Magazine article(abridged) for advanced learners. MAKING A SURVEY. 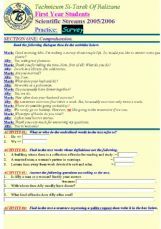 Mark: Good morning Mrs. I�m making a survey about couple life. So, would you like to answer some questions about the subject, please? Ally: Yes, with great pleasure. Mark: Thank you for taking the time. Now, first of all: What do you do? 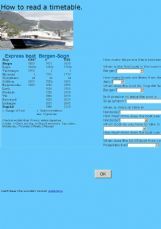 An exercise in reading times and a timetable for a boat. In the world of Jez Alborough, some dogs do fly! .... and �little pups� everywhere are encouraged to dream big. 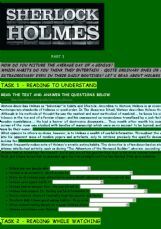 This is the third OE I�ve made about Sherlock HOlmes. 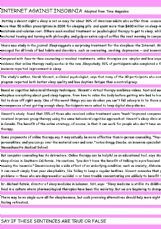 It contains two reading tasks - a multiple choice(based on a tex from Wikipedia about Holmes�s habits) and a true/false(based on a ppt video about Conan Doyle.). Hope you can use it. 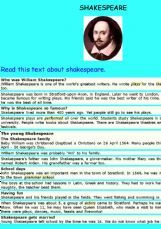 An easy reading about William Shakespeare and some easy exercises to check basic understanding. Appropriate for Primary School students. Guy Fawkes Night. Holidays and celebrations. 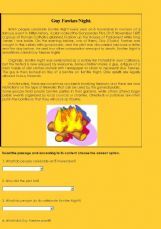 STUDENTS READ AND ACCORDING TO THE TEXT THEY CHOOSE THE CORRECT OPTION THAT ANSWERS THE GIVEN QUESTION. 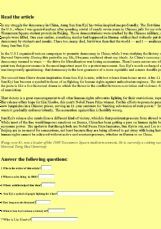 An adapted Time Magazine article followed by a true/false exercise and a lexis exercise.